If you spend time where sunshine is a rarity but rain, sleet, fog or snow are the norm, then we feel your pain. The 3.5 layer SEAK Stormtight Jacket was specifically designed for our friends in places like Alaska, BC and the Pacific Northwest who expect to hunt, fish and just plain live in the rain for days on end but still want unparalleled breathability without sacrificing protection from the elements. With features like its three-and-a-half layer construction, Turret System Hood, waterproof zippers, ultratight adjustable cuffs and a super-burly construction, the SEAK is built for whatever you can throw at it. 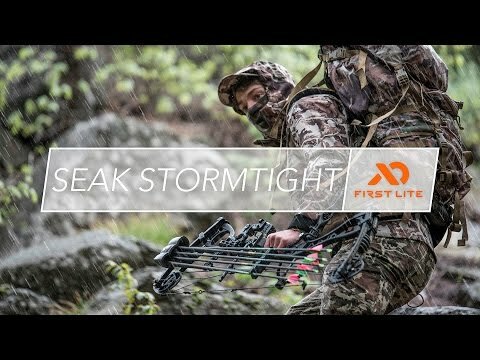 Compare this with its little brother, the Vapor Stormlight, and First Lite has your rainwear dialed from ultralight to bombproof. This jacket does exactly what it's supposed to... keeps you dry. I had it out now numerous times in torrential downpours and stayed dry every time. I had it paired with the boundary stormtight pants and the combo works. It is also very breathable so I wasn't sweating like a pig like can happen during the summer storms. Not as packable as the vaporlight but built tougher. Great product and highly recommended for when you know you are going to have storms. I got a size medium and it fits perfectly overtop my other layering pieces. The arms allow for movement without having extra fabric getting in your way. Great design. This jacket is great. Keeps you dry in heavy rains and isn't too hot. The only downside is that it is a little noisy, which comes in to play when deciding what to wear during archery season. But then again, most good quality rain gear is a little noisy. Either way I got a steal on this jacket at $255! Fits good with still some room to add some layers underneath without feeling ackward. put in on and sat in the shower for a bit. It works. Sleeves are long enough and large enough for my arms which was nice. Jacket does as described. keeps you dry no matter what. wore this jacket thru many thunderstorms this summer fly fishing in the mountains and never once got my clothes wet. hood extends past nose keeping rain rolling down the hood off your face. all zippers completely water proof as well. did some bushwhacking in this jacket and got caught on a few limbs without any cuts or snags occurring . would not hesitate buying this jacket , and i will buy again if i ever wear this one out.